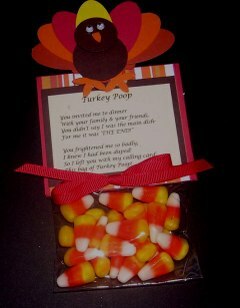 Thanksgiving Card & Hostess Gift? I wanted to do some things with turkeys for Thanksgiving...for the Mistletoe Craft Show I did last Saturday. You know, something cute that folks can give to their hostess who is serving up a wonderful Thanksgiving dinner next week, so first I made a turkey card! I think Pick a Petal is such a wonderful and versatile set-and this card is the perfect example! Tom Turkey's feathers are made from the petals-turned around the opposite way you would make a flower...imagination that! I think it's cool when you can do that with a stamp...use it in a different way than what it was intended for! I used the Kissing Technique to make the feather designs, punched the turkey's head with a 1" Circle Punch (sponged the edges with More Mustard Classic ink pad and cut the bottom freehand from a scrap of Kraft cardstock (not too shabby...hey?) The eyes are drawn on (or you could use the 1/8" Circle Punch), and the nose was made from a triangle cardstock scrap and reshaped. Caramel Gingham ribbon is tied around his neck before attaching with Stampin' Dimensionals over the feathers. The Corners were done with a new punch from Stampin' Up! called Photo Corners Punch. 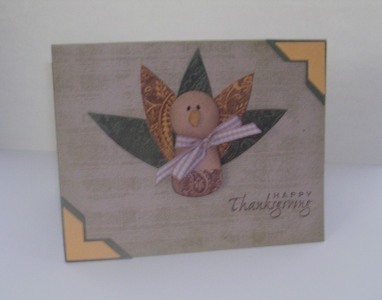 It's really cool because it punches two different size corners so you can layer them on top of one another, as I did on this card...the Happy Thanksgiving greeting stamp is from the Holidays & Wishes stamp set-a simple little 6-piece stamp set with three holiday stamps and three wishes. You wouldn't believe how POPULAR this stamped gift was! I came home with only a few...and I made alot of these little critters! I hope you dazzle everyone with your turkey creations this Thanksgiving holiday...I think I'm getting a little "punchy" myself and in looking at the clock, I can see why! I can't believe it's 2:00 a.m. (EST)!!!! (I could swear it was just 10:00 when I started stamping and blogging! Time really flies when I'm stamping but it's AMAZING how fast it also goes when I'm BLOGGIN' about STAMPIN'! Time for this country stampin' bumpkin to hit the hay!